We’ve dusted off the laser cutter, brought out the craft supplies, and we’re eager to get back into the maker game. As we continue to work towards our ultimate goal of opening a makerspace, in the meantime we’ve decided to host a quarterly workshop series titled, Cultural Creations. 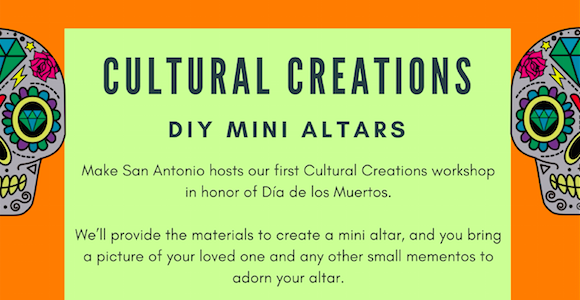 Our inaugural workshop will focus on Día de los Muertos, and we’ll be making mini altars. We’ll provide the materials which will include a custom, laser cut mini altar, painting supplies and other resources. We ask that participants bring a picture of your loved one and any other small mementos to adorn your altar. We’re super jazzed to be hosting this event at FELIZ MODERN, a lifestyle store with a quirky mix of modern and vintage goods that combine our love of art, home, and entertaining. We’ll be set up in FELIZ MODERN’S Studio, the gallery space inside FELIZ MODERN. We’re providing snacks, drinks and a good time. Sign up today before it’s too late! For each purchase, Make San Antonio will donate one Día de los Muertos mini altar kit to a local school’s art club.